I have been particularly taken with figs this year. It started with the slightly early arrival of fresh figs at one of my favorite stalls at the farmers' market. I was so surprised to see them...and then when I got them home I was struck by how fine they were...soft, juicy and very sweet. When I saw some at the grocery store a few days later, they too looked very good, so I purchased some more. Maybe it is a good year for figs...I really don't know....but I have been enjoying them almost every day now for the past few weeks. They are of course wonderful raw—as a snack or as part of my breakfast bowl of fruit and yogurt. But they are also very good when they are cooked—responding well to grilling/broiling or roasting. 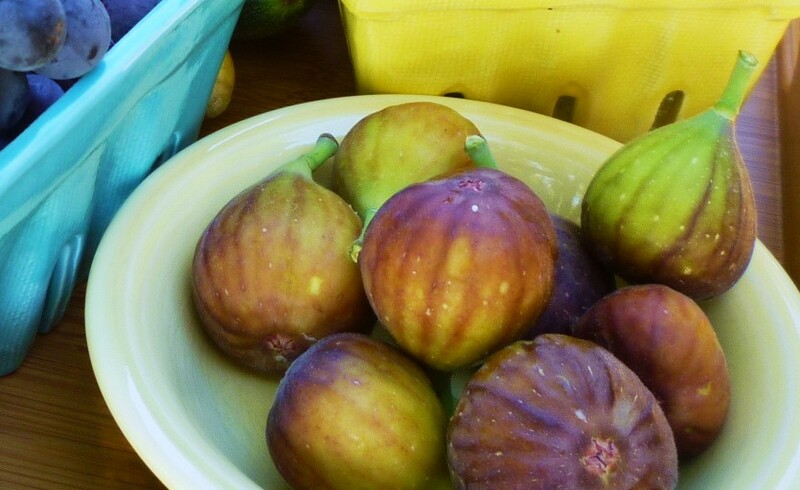 I wasn't introduced to fresh figs until later in life. I grew up on dried figs and Fig Newtons. I don't remember the first time I ever tasted a fresh fig, but I do remember where I first had a truly good fig. It was in Provence. The place I worked there had three huge fig trees, and I was fortunate enough to be there right in the middle of fig season. The figs were delicious...one of my favorite memories of my time there. So to celebrate the wonderful figs that I have been enjoying this year, I thought I would post a recipe for oven-roasted fruit that comes from Provence. The recipe I'm sharing is my adaptation of one I found in Ina Garten's Barefoot Contessa Parties! She learned how to make it while visiting a friend in Provence. Her version doesn't happen to include figs, but she mentions that this simple dessert is adaptable to all kinds of soft fruits. For some reason it is always late summer or early fall when I think to make this dessert—right in the height of fig season. I always include figs—along with raspberries (a match made in heaven). with browns and mauves mottled with green in between. Part of what I love about figs is how beautiful they are to look at. When you purchase them, make sure you purchase enough so that after you have tasted them fresh you can include some in an oven-roasted fruit compote. As for the recipe, although I am including it in detail at the end of the post, you really don't need it. It is the method that is important. You can choose any mix of fruit and pretty much any quantity fruit. (For the pictures in this post I used a quarter pound of figs, a quarter pound of prune plums, a heaped tablespoon of sugar, most of the juice of half an orange and a third cup of raspberries.) The method is appropriate for all of the stone fruits (plums, peaches, nectarines, apricots and cherries) as well as figs. The chosen fruits should be cut into large, even chunks and the dish you use should be a gratin or shallow casserole that is just large enough to hold the fruit in a snug single layer. Fill the dish with the fruit (arranged cut side up). D﻿rizzle enough liquid (water, wine, orange juice...) over the fruit to coat the bottom of the pan and then sprinkle the cut surfaces of the fruit with sugar to taste—about 2 to 4 tablespoons per pound of fruit, depending on the sweetness of the fruit. Transfer the dish to the upper third of a hot oven and bake. The goal is syrup-y, tender, caramelized fruit. The compote can be served in many ways. It is delicious warm or room temperature...even cold. 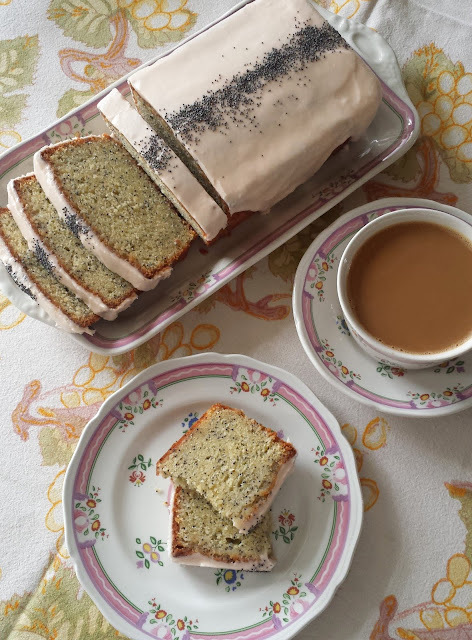 I like it with cake (it is particularly good with a toasted slice of Amor Polenta) or ice cream, but it would also be good simply garnished with whipped mascarpone or crème fraiche...with maybe some cookies on the side. If there happens to be some left over, it is excellent with yogurt for breakfast. Place the figs cut side up in a snug single layer in a glass or ceramic baking dish. Add enough liquid to just coat the bottom of the pan. Sprinkle the figs evenly with sugar. Bake in the top third of a preheated 425° to 450° oven until the edges of the figs are beginning to caramelize—about 15 to 20 minutes. Scatter the raspberries over the figs and return the pan to the oven for another 5 minutes to warm the raspberries through (or place under the broiler for deeper caramelization of the figs). Serve warm or at room temperature spooned over Lavender honey or vanilla ice cream or pound cake. Serves 4 to 6. Variation: Substitute medium plums and/or medium peaches for half (or all) of the weight of the figs. The plums should be quartered (prune plums should be halved) and the peaches cut into sixths or eighths. Note: If at any time the pan appears to be dry or the juices look like they might be reducing too much, simply drizzle in a bit of water. I've never tried fresh figs, but I've noticed my grandmother had a number of fig recipes in her recipe box, so I may have to explore this fruit a little more. This compote would be a good way to start! Linda, I think you will like the compote...and it sounds like you have a treasure trove in your grandmother's recipe box! I LOVE fig preserves. One of the things I loaded my suitcase with when I came home the first time from Provence was Fig preserves (that and honey and olive oil). I would eat it all by itself on buttered toast.